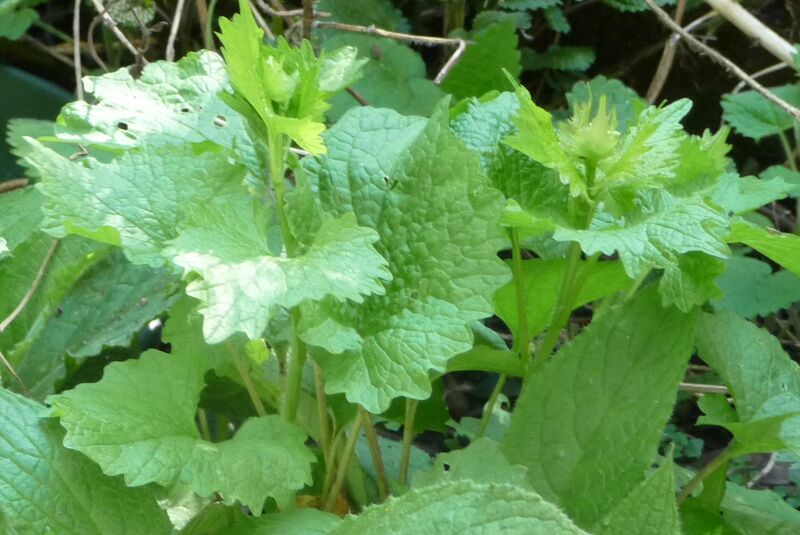 Fresh green leaves of Garlic Mustard appear in the first year of this biennial. In the second year these give way in April and May to small WHITE cruciform flowers. The flowers go on until June, when they are followed by pods bearing many tiny seeds, which are easily scattered by wind. 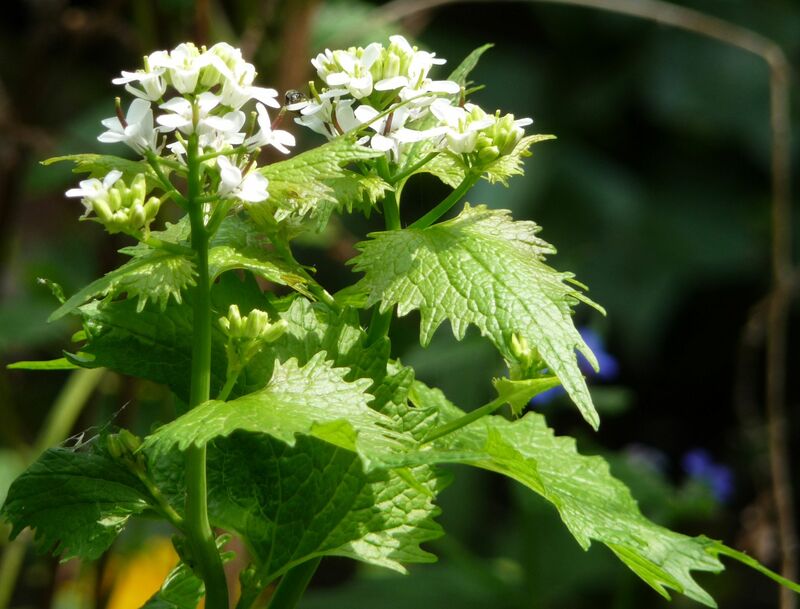 Garlic Mustard is a food plant for the Orange Tip Butterfly. 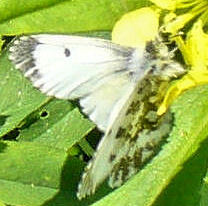 The female Orange Tip tastes the plant with her feet, then lays a single egg. The larva are carnivorous, so each is given its own plant; they feed on the flowers and seedpods. FOOD FOR FREE, Richard Mabey, Harper-Collins, 2004. Other names: Alliaria alliaria, Alliaria officinalis, Erysimum alliaria, Garlicwort, Hedge Garlic, Garlic Treacle-Mustard, Garlic Root, Garlicwort, Jack-by-the-Hedge, Jack Run Along by the Hedge, Jack-in-the-Bush, Lady’s Needlework, Penny Hedge, Poor Man’s Mustard, Sauce-alone, Sisymbrium alliaria, Sisymbrium officinalis. One Garlic Mustard plant, from a wildflower sale at the Ecology Centre, was planted in the Wildlife Garden a few years ago. The following spring three plants appeared, and we have had Jack-by-the-Hedge ever since. 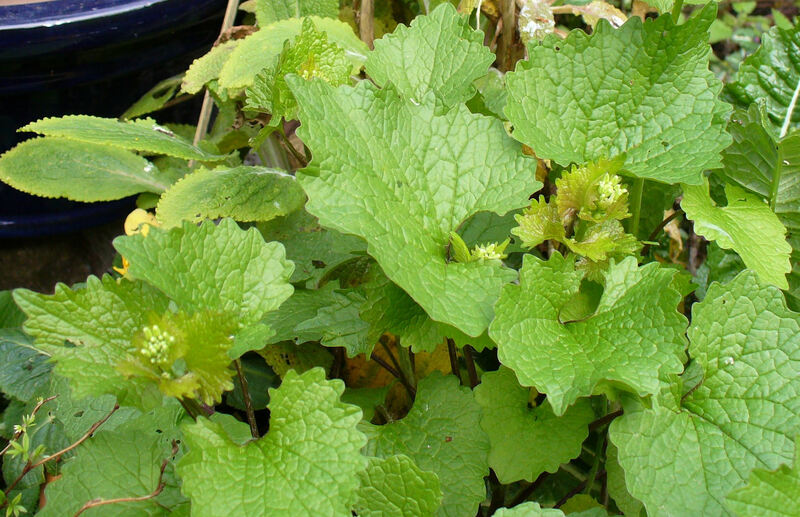 Be warned: masses of tiny seeds can produce an over-abundance of Garlic Mustard.